Have you clicked into your analytics account only to look at a bunch of meaningless geometric shapes? Believe me, we’ve all been there. In this day and age, there is SO much data available at our fingertips that it can be easy to detract from our greater goals. Without deriving meaning from the numbers, they are just that; numbers. Of course, you COULD hit up Google and look up all kinds of mathematical equations and perform some number wizardry to really get that value you need, but who has the time for that!? Unless it’s your job to work with these numbers daily, you’re probably just looking for some key performance indicators and an idea of where improvements could be made. So what is the secret behind HubSpot Analytics, you ask? Well to answer that question, with HubSpot Analytics, you can QUICKLY and EASILY access data with attached value. Interested? 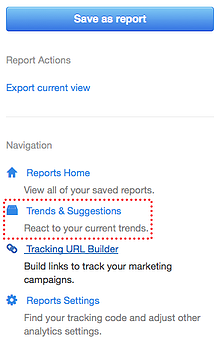 To start, click into Reports > Sources, then on the right hand side, look for a button to “Trends & Suggestions.” This spot is seriously the mother ship for busy marketers and executives! Depending on the type of information you are looking for, there are different factors you can choose from to cater information in a specific area. This is where the true secret of HubSpot lies. Not only will you get a snapshot view of various data points, but you’ll also get small snippets of information that can help you better interpret the data. In the drop down that has “All Trends” choose “Decreasing.” This will provide all data points that are trending negatively. This is a great tab for someone such as a marketing manager because you will get a broad overview of any particular area that could use some improvement. Alternatively, you can select “Increasing” to get a better understanding of which efforts are paying off. This is a great tool to browse if you’ve recently launched a campaign. At-a-glance, you can start to determine which solutions work best for your personas. These are areas where you’re likely to reach them in the future. Selecting “All Trends,” “All Metrics” and “Paid Search” will show both the amount of visits from search and the contacts generated. I know I said that math didn’t have to be involved, but in this case I think one quick and easy formula is worth a couple minutes of concentration. **BONUS** This formula can also be used throughout each of the other sources as well! Compare your rate with industry averages to determine if you’re on the right path. Looking a little low? Perhaps a tweak to the content of the ad would help, or maybe paid search isn’t the best marketing tool to use for your personas. This information can really help you tailor your efforts to fine-tune how much is going out vs. how much is coming in. Take the example I’ve provided below. This week, we’ve seen an increase in visits from referrals; this is a really important data point for us, as the traffic we receive from referrals is often very qualified, and is more likely to become a customer than from some of our other platforms. First, I want to make sure that we’re hitting the numbers we want. Next, I might be curious as to where this traffic is coming from; HubSpot makes this next step easy by providing a link to the “Sources Tool,” where you can find more detailed information on where traffic is coming from, the number of visits, the visit to contact conversion rate, the number of contacts generated from that referrer, the contact to customer conversion rate, number of customers, and then finally the visit to customer conversion rate. Depending on my goals, I may even want to take it a step further by clicking into one referrer to see the exact URL driving traffic. Chances are I will be able to work further with this company, and share relevant information between the two of us to better benefit our viewers. In order to find this information in Google Analytics, I’d have to click into different views, set up secondary dimensions, and then specify the timeline. HubSpot is a very powerful resource and allows you to get access to this information quickly. Seeing a decrease in contacts from organic? Check out which keywords you “ought to be targeting” in your Keywords tool. 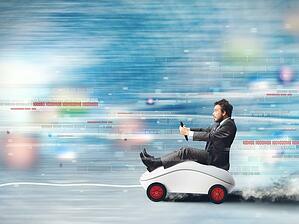 Maybe your on-page optimization could use some sprucing up. Increase in visits from social media? Take a look at your Social Interactions tool to do a little digging. Maybe you’ll discover a valuable resource that’s driving traffic that you were unaware of! Decrease in visits from e-mail? Run through your Email tool to create a new campaign. The metrics are all there. What you do with them is up to you.